Blonde - the first beer in Australia to be marketed as low carbohydrate - is full strength and great tasting, with 70% less carbohydrates than a regular beer. Now the fastest growing packaged regular beer brand in Australia, pure blonde is proving to be a big hit with beer lovers, with 94% of people who try pure blonde buying it again. 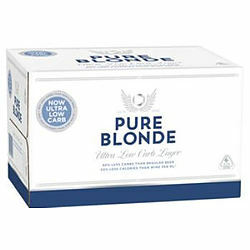 Pure Blonde (4.6%ABV) is a light, crisp, aromatic lager that delivers a superior taste. It has been specially brewed longer to produce a beer that is low in carbohydrates, Pure Blonde's advance brewing techniques and pure ingredients creates a satin smooth finish and it is immensely refreshing served ice cold.